The Psychedelic Gedankenexperiment is a declaration claiming the psychoactive event of lysergic acid diethylamide (LSD) as a "found performance" and as "the art experience par excellence." The claim is expanded upon, suggesting that over time it will be heralded as the most influential work of art of all time. First the artist contextualizes and frames the "variable qualities and dimensions" of the work. This is followed by a list of attributes of the work of art, suggesting a comparison with other art (experiences) and showing compelling reasons why the power of The Psychedelic Gedankenexperiment would not only be difficult to dismiss but forces a re-evaluation of the entire historical paradigm of what constitutes great art. 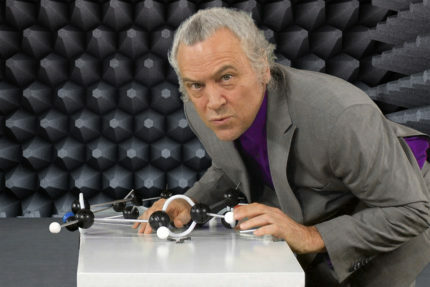 The artist's "performance" takes place in an anechoic chamber which has been computer generated. After unfolding an abstract origami-like object that turns out to be a table with forced perspective, the artist delivers the text while constructing a large molecular model of lysergic acid diethylamide which takes the time of delivery to complete. The entire work is performed backwards, including both movement and speech, which has then been reversed to "correct" it into a comprehensible form. This process was first used by the artist in the 32 minute videotape entitled Why Do Things Get in a Muddle? (Come On Petunia), 1984. The Psychedelic Gedankenexperiment was recorded in 3D, and the viewer puts on glasses to produce the 3D space. The forward and backward versions play simultaneously in sync--one forwards and one backwards on two facing projections. 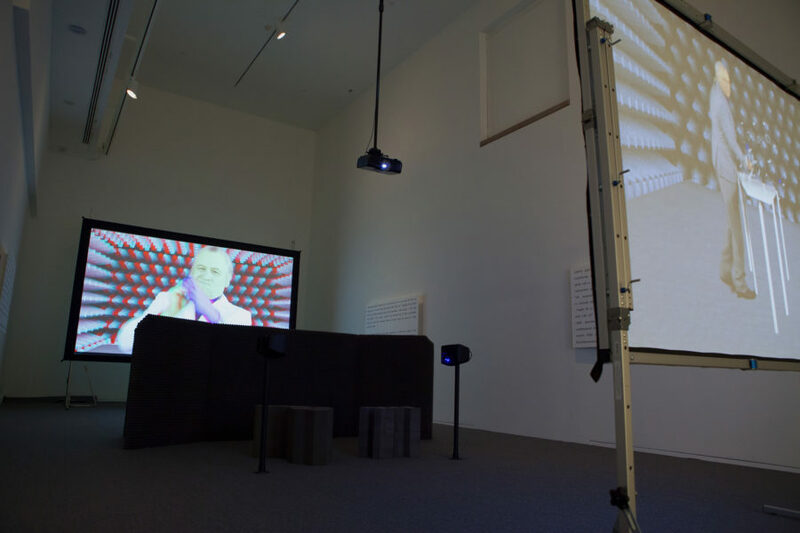 On the left is a smaller projection in 2D of the real time recording of the artist speaking the text backwards. It’s important to note that this is actually the vocalization of sounds that when reversed are revealed as the text in comprehensible form. The four text panels on the walls are the language signs the artist developed in order to pronounce the sounds backwards. This projection serves as a kind of referent as to the making of the work, and yet the "abstract" sounds, reminiscent of the experience of hearing a foreign language one does not understand, have a dimension all their own. 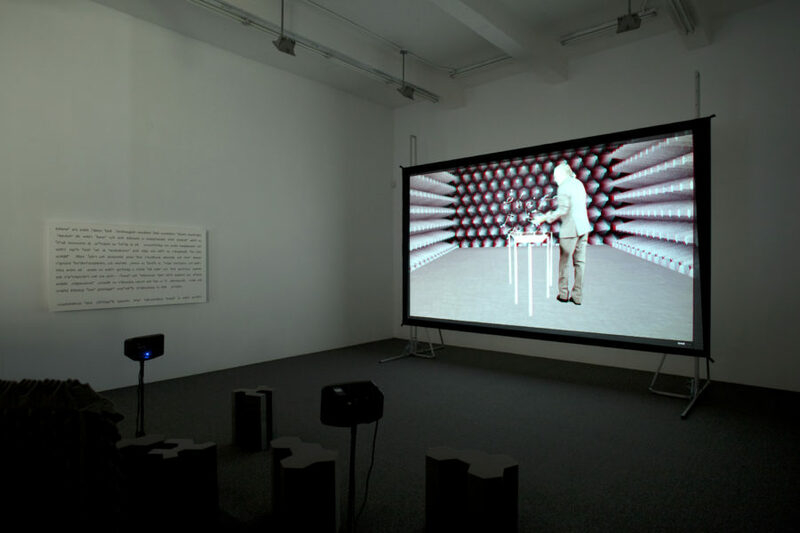 On the right is a larger projection of the work after being reversed – "corrected" for the viewer to "understand" the speech. In front of both screens are specially fabricated foam "chairs" based on the molecular diagram of LSD. Framing each seating area are a pair of speakers on tripods offering detailed hearing and adding to the performance-like presentation. The varying size of the two projection screens produce an invisible frustum across the entire space. I am taking the liberty, as artists do, to declare Lysergic acid diethylamide (LSD) as thee art experience par excellence. Although, originally discovered (somewhat accidently) and then synthesized by the scientist Albert Hoffman, I’m claiming the psychoactive event itself as a work of art in the tradition of the “found object” ala Marcel Duchamp. In this case, it’s perhaps closer to a “found performance” with variable qualities and dimensions. Granted, there are problematic questions regarding what exactly defines the claim. Categorically, It is not the physical properties of capsules, windowpane, blotter paper or sugar cubes that constitute the work—they are the transporters or carriers—something like the way light carries a painting to its viewer. It’s more akin to the synaptical space, a kind of smear, between the stereoisometric drawings coupled with the chemical procedures and more definitively, the trip itself. Rather than set boundaries of time or place for initiation, I leave that open to the individual viewer or practitioner. As a point of departure, a minimum dose of 250 micrograms is necessary for the work to be “shown”. There is considerable suspicion around art that exists primarily through intention and declarative language. And, indeed, there are worthy questions--where is the artist’s hand, his fingerprint and what is the evidence of something having been created? As with many works of art this remains open and perhaps unanswerable--a conundrum for some, a complete joke for others. Further to the claim, I consider the work to be the most powerful and in time the most influential work of art throughout all of history. Laughable right? Perhaps. But let’s take a closer look. Assuming that art could possibly be judged at all, what would be the criteria, what do we demand and want from art? For comparison sake, let’s ponder some of the characteristics of The Psychedelic Gedankenexperiment. It is experiential and acutely phenomenological —no supporting context necessary whatsoever at all. It is fully Immersive and interactive providing a complete epistemological reset. The spectator experiences lush Sensorial awakenings woven with spectacular auditory and visual phenomena. Waves of therapeutic psychological reflection ripple through thoughts. One has overwhelming experiences of “spirituality” “love” and the “interconnectedness of all things” . There is the desire to ponder the big questions—a kind of ontological carnival of mind takes place. Concepts of body, space and time are thrown out the window. Notions of the status quo become comical. It is awe inspiring and forever memorable. It is to the art world what gold is to the central bank . There is the sense that contacts with extraterrestrial beings are possible. Deep primordial sensations are visited. It is transformative and life changing. It is finally profoundly beautiful.